NEW RIVER, Ariz. (KPNX)―Investigators from the Maricopa County Sheriff’s Office Animal Crimes Unit have seized 16 neglected animals from a youth rehabilitation facility in New River. 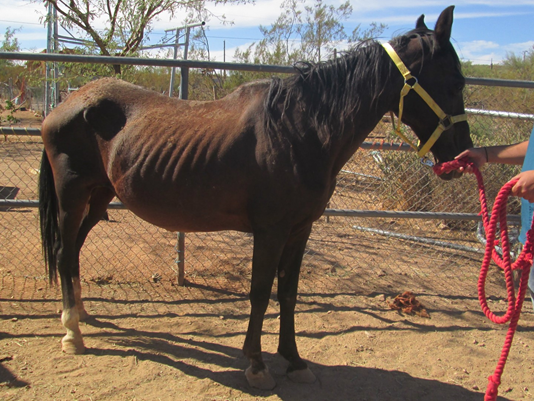 MCSO seized eight horses, one foal, one miniature donkey, five adult dogs and one puppy. All are in emergency veterinarian care. According to the sheriff’s office, one of the animals, a mini horse, had to be euthanized when it was removed from the property. Remington turned the animals over after neighbors made complaints to MCSO, saying they had observed the animals in terrible conditions without food and water. Investigators said Remington told detectives he didn’t have money for a veterinarian to treat the animals and signed over ownership to the sheriff’s office. Three teenage boys, believed to be from Ethiopia, appeared to be working the property and attending to the animals, according to the sheriff’s office. Deputies said the three showed no signs of physical abuse. Investigators said there are unanswered questions as to how the Ethiopian teens came to live at the ranch, which is not licensed with the state of Arizona. MCSO contacted the Arizona Department of Child Safety, which will open an inquiry into the welfare of the children.